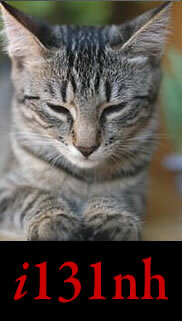 For more information on cat thyroid disease, check out this pet information article at vcahospitals.com. Does not affect normal thyroid tissue or the nearby parathyroid tissue. Experts agree that I-131 is the preferred method of treating hyperthyroidism in cats. The total cost of I-131 is less than other treatment methods. I-131 works best in the stable hyperthyroid cat without other significant diseases (renal, gastrointestinal, cardiovascular, other endocrinopathies). If your patient has a significant other disease, please contact us to discuss whether I-131 is appropriate for your patient. The referring veterinarian performs ALL the pre-treatment and post-treatment testing. As part of our service, we offer consultations with the referring vet prior to treatment and for three months post-treatment. We only accept I-131 patients from a referring veterinarian. Click here for the Primary Care Veterinarian Referral Form. Click here for Referring Veterinarian Information and Work-up Instructions. Please review these important facts about an I-131 referral. Your pre-therapy workup needs to consist of the following items. We need copies of these results (including x-rays) along with any pertinent medical records. T4 within 30 days of the I-131. VD (or DV) and lateral thoracic radiographs. If the patient is currently on methimazole or PTU -- and has been for more than 90 days -- we require a T4 taken 7 days after cessation of this medication. If you have questions, we can suggest a schedule for stopping, being retested, and arriving for therapy. Please supply all previous T4 values, histories of biopsies, cancer, & acute episodes. For peace of mind of our staff, and in accordance with New Hampshire State law, cats need to be current on their Rabies vaccination. Patients MUST be off methimazole or PTU for at least seven days prior to admission for I-131 therapy. Other medications which may interfere with therapy include: ACTH, Anticoagulants, Antihistamines, Antiparasitics, Bromides, Butazolidine, Mercurials, Nitrates, Penicillin, Pentothal, Perchlorate, Salicylates (large doses), Sulfonamides, Thiocyanate, and some Vitamin preparations. Patients are hospitalized in the nuclear medicine ward for approximately seven days. Due to State and Federal radiation rules, clients cannot visit patients during therapy, nor can patients be removed from the ward until officially released. Clients cannot terminate therapy or arrange for early release once therapy has begun. We do have a streaming webcam that owners can use to ‘virtually’ visit their pets. (Click here for link). After admission for I-131 therapy, information on a patient's daily status will be given by our personnel if the owner requests. Three month and/or as needed follow-up consultations regarding test results between us and the referring veterinarian. Post-therapy T4 determination performed at your clinic. Patients are released to owners according to State and Federal rules. Patients will be excreting a small amount of I-131 on dismissal. Clients are instructed before admission -- and given written instructions -- on handling of patients for two weeks post-release from therapy. A litter disposal kit consisting of clumping, flushable litter, latex gloves, and a litter scoop, is given to clients. If clients are unable or unwilling to comply with these precautions, they should consider surgical or medical management. If a patient requires medical attention or hospitalization during the two weeks immediately following treatment, please contact us. Patients may become hypothyroid. Rare cases may need exogenous thyroid supplement. Sore throat, dysphagia. This is usually transient, but a permanent voice change is possible.